Any DIYer will tell you how vital wood glue is when working on a particular project. In most cases, you use wood glue to join two pieces together – these parts are typically wood, but the adhesive is quite versatile. Whatever hobby you have chosen, wood glue is one liquid that you can’t just be without. There are a number of factors that you need to consider when choosing the right wood glue. Among them is whether you will be using it indoor or outdoor. The material will also play an important role in your decision-making process. The following is a review of some of the best wood glue and any kind of DIY project you have. Apart from the type of material, you will be utilizing, there other factors that you need to consider. They include viscosity – this is just a term used to indicate the degree of liquid consistency. The low viscosity wood glue is appropriate for small projects such as filling cracks on furniture. You can also use it on making little things such as jewelry. This type of glue is runny and messy, and you will need a piece of cloth to wipe any excess amount. It dries pretty quickly. The high viscosity wood glue is perfect for heavy duty projects – not the bead joining type of projects, of course. You use to join two pieces of wood, fiberglass, leather, and others. Another thing to consider is whether you would instead go with white or yellow wood glue. The main difference between them is that white glue is water resistant and perfect for outdoors while the yellow glue is not and is, therefore, best suited for indoor use. This is one of the best wood glue you can find for your DIY. It is a water-based adhesive that will penetrate deep into the wood and create a long-lasting bond. As a matter of fact, the Gorilla Wood Glue helps you complete projects in a short time. “Gorilla Wood Glue” is a PVA glue, not polyurethane, and so is not waterproof. 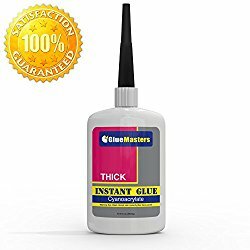 You do not need to moisten the surfaces before applying this glue. Just plain “Gorilla Glue” is polyurethane and is waterproof. Before applying this glue, you should lightly moisten the two surfaces. Even though it doesn’t have “wood” in the name, it works well on wood. You can use this product both indoors and outdoors. And what makes it one of the best wood glues is its versatility – you can use it on both hardwood and softwood. This glue is water resistant meaning that it is perfect for any kind of outdoor project you have. If you have a ceramic or glass project, this wood glue will work pretty well making them pretty durable and long-lasting. Gorilla Wood Glue is easy to apply and requires about 30 minutes of clamp time and 24 hours of setting to make your project super strong and durable – this is, of course, the joy of any DIY. It is thick viscosity wood glue and will bond most of the materials you throw at it. And when Gorilla Wood Glue dries, it turns to a wonderful tan color – this saves you the embarrassment of having to deal with unattractive marks. The only shortcoming of this product is that the dispenser nozzle is pretty difficult when you need to clean it. This means that slowly becomes difficult to dispense the glue. Franklin International is a brand that has a carved a niche in glue making industry – they are industry leaders by all accounts. This wood glue is the best indication of this leadership. The product has a thick viscosity and is water resistant making it appropriate for both indoor and outdoor use – you always want a product that has no limitations. 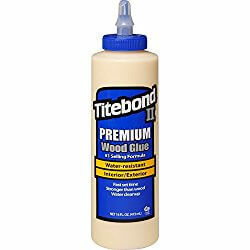 You can use this glue on a wide variety of woodworking projects. Its setting time is pretty short – within an hour and 24 hours for a full set. There is always this worry when you have pets and children around. This product is FDA-approved for indirect food contact – this means that you never have to worry about having a case of food poisoning or something of the sort. You can thus use it on making kitchen equipment such as the wooden chopping board. Even though this wooden glue is thick viscosity, it proves runny on specific applications and which is not really a good thing – you get to use a lot of it and can sometimes be ineffective. You will, therefore, need something like a piece of cloth to wipe off any excess amount of wood glue. Regardless, this product demonstrates a good level sandability and dries fast – you don’t have to wait for long to see the outcome of your project. And unlike other competing products, this glue comes with a non-clogging nozzle – a good thing of course. Some of its shortcomings include the fact that it is not the best at temperatures below 55 degrees. It is not viscous enough for some projects. This is wood glue is perfect for both indoor and outdoor applications making it one of the best wood glues for chairs around. It is water resistant and can be used in a variety of wood applications for outdoor items. Titebond III 1413 is FDA-approved for indirect food contact meaning that you are free to repair that chopping board. When it dries out, the wood glue has a tan color – not too shabby for a number of wooden projects. The product is versatile, and you can use in a wide range of places – you can repair furniture, and use on glass, leather, and cloth. Its superior level of adhesive strength and standability makes it perfect for a variety of applications. The glue is not very expensive and demonstrates a high level of waterproofing. However, it has a low level of viscosity making it a bit challenging to work with – you may struggle to try to repair the various cracks on a piece of furniture. It can quickly run downhill when you apply it, and that can leave you trying to figure out what you can do to clean the various stains on it. If you have any indoor application or repair, then this product may be the best. This works best on both softwood and hardwood. It is also perfect for various applications that don’t need to be on the outside. While this glue is yellow, it changes to tan which is ideal for a natural look. Another thing about this glue is that it dries quickly. The clamping time is about 12 hours – pretty short. And when applied with a paintbrush, the glue is non-visible – an important quality when it comes to some DIY project that you doesn’t want the glue appearing anyhow. It is water resistant, and so you don’t have to worry too much about water ruining everything. The glue does not produce toxic fumes, and so you may not need a muzzle when applying it on a surface. The invisible and super strong bond it creates is ideal for carpentry other DIY projects you may be having. This product is easily one of the best wood glue for chairs because you can paint on it and sand it. The wood glue is also not hard to clean with water. The only major limitation of this wood glue is that it cannot be used outdoors – this needs to acquire you to get a different product if you have an outdoor project which can thus prove expensive. The glue is also not stainable. Toy makers deserve the best wood glue and this product perfectly fits the bill. The product has an industrial strength to bond your equipment perfectly. And the good thing is that it works at just under a minute – pretty fast. 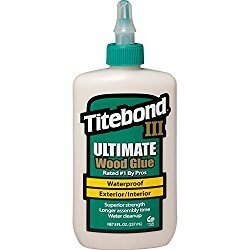 In all honesty, this is one of the most versatile wood glue you can find. You can use it for home repairs and carpentry works. It also acts as your best DIY partner as a matter of speaking. The glue is pretty non-toxic and is easy to clean water without ruining the bond. In terms of viscosity, this wood glue is well balanced for any use – it will not run off downhill as you use creating a mess and it will not prove problematic getting into small spaces like cracks. Ardent DIYers know how useful having the right texture can be. The decent flowing liquid makes your work such a breeze that you don’t have to struggle joining them together. Another highlight of this glue is that it dries clear and so it will not leave those nasty marks you often see in some finished projects. And to demonstrate the significant faith they have in their products, the manufacturer offers a satisfaction guarantee of 60 days so that if the glue is below your expectations, you get your money back – which better deal can you get? Some of its shortcomings include the risk of bonding your skin. You can imagine getting all that industrial strength on the skin – it would be tragic. It is also not adequately thick for some heavy duty applications. However, the issue of viscosity should not be too big to handle. You can always get the right product from the same manufacturers should you need to. If you are a DIY enthusiast and just love woodworking. Please watch the video. 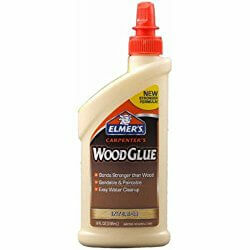 Wood glue is one product that any DIYer should never be without – if not, what would they be doing? However, you need the best wood glue there is to support your project adequately. You can choose any product above, and it will make your project so much easier. Franklin International 5004 Titebond-II Premium is our top pick from this review based on a number of factors. For starters, this glue is versatile enough to handle any project you have in mind. It is also applicable for both indoors and outdoors – much to your delight. The viscosity is right and its strength adequate. And top it all, the price not too badly off considering the kind of product you get.